Update July 22, 2016: Following accusations that CSGO Wild was part owned by eSports giants FaZe Clan, an official statement has been released from the gambling site to deny their involvement. However, potential new evidence claims to prove this to be inaccurate. In a TwitLonger, Gagey of CSGO Wild released a statement to brush off the claims of FaZe’s involvement, saying it went no further than paid sponsorships. “First off, FaZe Clan, and any of its members do not and have NEVER owned any part of Wild,” Gagey wrote. “Team Wild Inc. also know as CSGO Wild is ONLY owned by myself and my brother, Zach. Our incorporation documents can be accessed at this link. “In August of 2015, a few friends and I thought we’d make our own version of a CSGO jackpot website. We launched a beta of a game mode that was the first of its kind (1v1 jackpot). This later transitioned to deciding the winner over a coin flip. Soon after, we started to reach out to people with followings to get our new game recognised. Our first idea was to approach people we’d been friends with for years through gaming and our work on YouTube. Gagey says this relationship developed and because FaZe Banks and Rain played on CS:GO gambling sites already, they agreed to promote CGGO Wild in return for cash, skins and emeralds to be used on the site. This relationship was allegedly terminated over a month ago, just before the news broke on the TmartN and Syndicate CSGOLotto scandal, which is some good timing. After the TmarTn and CSGOLotto stuff started to surface, FaZe Banks was one of the only people standing by him on Twitter. Gagey ends his statement by saying that the site never altered game results or provided insider information to help streamers. All of this information has since been called into question by HonorTheCall, the YouTuber who broke the TmarTn story. In a new video, HonorTheCall shows chat logs which he claims are between a designer and members of FaZe. The first allegedly shows FaZe Banks admitting to being the site owner – a fact he has denied on Twitter. HonorTheCall also shows a chat log between a designer and FaZe Swan. The designer, who seemingly has some bad blood with FaZe Banks, is asking to work on CSGO Wild and is asking about FaZe Banks’ involvement. At this point, FaZe Swan allegedly claims that FaZe Rain owns a “good portion” of the gambling site. FaZe Rain also denies his involvement. Owner of FaZe Clan and only FaZe Clan. No matter what rumors you hear. 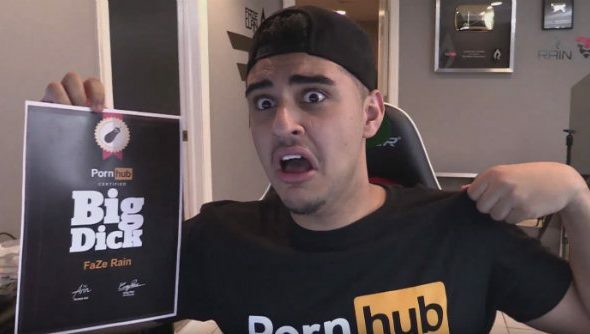 To add more fuel to the fire, FaZe Rain has allegedly been through his CSGO Wild YouTube videos and added sponsorship disclosures, as well as changing the name of the video in some cases. In the example shown, the video goes from “HOW TO WIN $30,000 IN 5 SECONDS…” to “I GOT SO LUCKY…”. If true, this is a clear violation of FTC rules. HonorTheCall says he has passed the evidence on to a prominent videogame lawyer who is working the case. Update July 19, 2016:Following the recent allegations that Twitch streamer PhantomL0rd had been betting on a CS:GO gambling site where he had access to the odds, his Twitch channel has been suspended. If you head toPhantomL0rd’s Twitch channelnow you are met with a message saying “The community has closed this channel due to terms of service violations”. It isn’t clear whether the channel has been taken down for the betting scandal or if it was taken down for another violation of the terms. It’s been suggested that PhantomL0rd had been purchasing or acquiring fake Twitch followers to bolster his numbers after the scandal saw him take a hit. Original Story July 17, 2016: Yet another massively popular streaming personality has been involved in a CS:GO skin betting scandal as James “PhantomL0rd” Varga is alleged to own a gambling site he heavily promoted, while using “house money” and asking for site odds to aid in betting on stream. The evidence for these allegations, provided to Richard Lewis by a hacker attempting to steal from the site CSGOShuffle.com, comes in the form of Skype logs which appear to be genuine. The logs strongly suggest PhantomL0rd – a Twitch streamer with almost 1.4m followers, the seventh largest on the site – is the owner, or at least has a vested interest in the site. Evidence shows Varga discussing a joint business venture with the target of the hack Duhau Joris, a French web developer whom owns the CSGOShuffle domain. Varga talks about their collective business and organises bank payments and cheques in excess of $20,000 to Joris, despite claiming to only be sponsored by the site once questions were raised about his relationship in the wake of Trevor “Tmartn” Martin and Tom “ProSyndicate” Cassell’s unmasking as the owners of CSGOLotto this month. Questions as to why a site would require payment from a streamer they are sponsoring are only compounded as Varga goes on to ask Joris to deposit skins into his account via one of CSGOShuffle’s bots used to collect bets as he has 24,000 viewers on his stream and nothing to bet with. Joris is concerned about Varga using 10% of the site’s revenue for advertising. 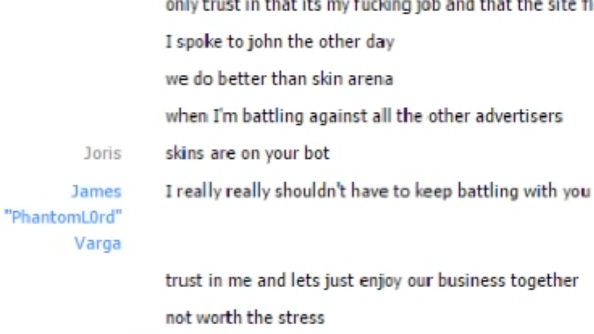 The third party Varga is referring to here, cAre, is known as one of the most prolific skin gamblers in the CS:GO trading community, and Lewis says there are logs implicating him as well that are currently being translated (as both Joris and cAre are French). Both cAre and Varga have won large sums from the site, as the Twitter feed currently shows a huge payout pot that both partook of in May of 2015. Further logs between Varga and Joris suggest that as early as November of last year he knew that CSGOLotto was owned by “Syndicate” and also that another site, CSGOWild, was affiliated with the eSports organisation FaZe. Accusations that CSGOWild (which stopped operating in the US shortly before CSGOLotto was exposed) is owned or part-owned by FaZe owner Ricky Banks and Nordan “Rain” Shat have been repeatedly denied by the two. He then asks several times over the next hour for a percentage, which varies between 69% and 15%, assumedly with the intent of only betting at opportune times. Valve responded to the initial CSGOLotto scandal by halting all third-party skin gambling sites as they were in violation of Terms of Service in place since 2010. PhantomL0rd gained global attention in 2013 after being one of the earliest victims of a “swatting” incident in which armed police raided his home after trolls placed hoax calls.